Whether it's for Halloween or a drama production, you may have need to create props that appear to be made from metal. Cardboard is one of the less expensive materials to build with and is very versatile, no matter what prop you are creating. You can easily transform your cardboard prop into something that realistically resembles metal by using a spray can of metallic paint. These paints are available in a variety of colors that includes gold, silver, copper and even shiny chrome. They all result in a very realistic-looking finish. Work outdoors or in a large, well-ventilated area. Spread old newspapers, large plastic garbage bags or a drop sheet on the floor underneath and around the prop to be painted. Put on a face mask to protect yourself from the strong fumes. Wearing disposable gloves will make clean-up much easier. Hold the spray can about 12 inches from the surface of the cardboard to be sprayed. Check the instructions on the can to determine the optimum distance. Depress the nozzle on the can for a couple of seconds as you move your hand in a back and forth motion. Overlap the spray with the previously-sprayed area as you continue to apply the paint in several short bursts. Continue spraying in this manner in the same direction, until the cardboard is no longer visible. Allow the paint to dry completely before touching or moving the props. Check the instructions on the can for the estimated amount of drying time. Clean excess paint off your arms using some old rags and paint remover, if necessary. 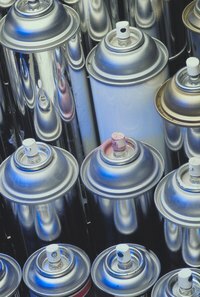 For a very professional-looking smooth surface, use a primer coat before you spray your metallic color. If you hold the spray can too close to the cardboard, the paint will drip. Keep a uniform distance while you spray.